Microsoft Corporation (NASDAQ:MSFT) was, at one time, the most dominant technology company on the planet. With the release of Windows 1.0 in 1985, which was the first time users were able to interact with their computers using a mouse and visual representations of files and folders, MSFT exploded as its new “Windows” operating system took the world by storm. The rest is history. In just a few short years, the vast majority of the world’s desktop computers were running Windows, and competing operating systems were so far behind that they weren’t even visible on the radar. The first version of Microsoft Office — namely Word, Excel and PowerPoint bundled together — debuted at the end of 1990, and it, too, quickly became the de facto standard. MSFT enjoyed its position as king of the computer world for nearly 15 years — while Microsoft stock skyrocketed more than 28,000% — until a late spring day in 2010, when Apple Inc. (NASDAQ:AAPL) finally surpassed Mr. Softee as the world’s most valuable tech company. With Steve Jobs and Apple’s revolutionary iPhone capturing the attention of exponentially increasing numbers of consumers, AAPL continued to take bigger bites of the technology market share pie. However, MSFT persevered and continued seeking new, innovative ways of expanding its Windows OS. Unfortunately, Microsoft management failed to jump on the smartphone bandwagon in a meaningful way, while Apple put the bulk of its research and development into innovating the iPhone. To make matters worse, two years later, Google Inc (NASDAQ:GOOG) surpassed MSFT’s market share,knocking the PC pioneer to the world’s third-largest technology company as of October 2012. With an abundance of revenue thanks to its dominance of the search engine market, Google had jumped head first into the smartphone arena with the release of Android 1.0 in 2008. MSFT did not attempt to join the mobile device race until 2010. By that point, AAPL and GOOG were just too far ahead, and the Windows Mobile platform failed to gain comparable attention. Since then, MSFT has put significant effort into capturing a larger chunk of the mobile device market, but products from Apple and Google have proven too powerful. However, on the enterprise side of the tech industry, Microsoft has remained a viable competitor in the server and cloud computing space, effectively defending against newer, younger rivals such as Amazon.com, Inc. (NASDAQ:AMZN). All the while, Microsoft Office has remained the foundation of document creation across the globe, and the suite has grown from a mere three programs to more than a dozen. Of all the products developed by MSFT, Microsoft Office is perhaps the most successful. In an effort to remain relevant in the mobile space, MSFT announced earlier this week that it has reached an agreement with 31 Android original equipment manufacturer (OEM) partners to preinstall Microsoft Office on a host of current and future tablets. The idea is to expose a larger number of mobile users to the apps than what would be possible with sales of MSFT devices alone. Management touted this as a way to add value to those tablets, describing mobile Microsoft Office as “the rich productivity experiences customers want.” The announcement vaguely hinted at compensation for OEM partners, but specific details were not revealed. More than likely, the preinstalled Microsoft Office apps will be only trial versions; the apps will either function normally for a period of time, say 30 days, before requiring a paid-only subscription plan, or they will function in a limited capacity — meaning the most essential features will be disabled — unless a subscription is purchased. In theory, MSFT’s plan seems like an effective way to generate new revenue and boost subscriptions to its Office 365 cloud platform — take mobile versions of the world’s most popular document suite and force them in front of users of the world’s most popular mobile operating system (OS). Some users will welcome Microsoft Office apps on their tablets, and some might even be willing to pay for subscriptions. The reality, however, isn’t likely to live up to Microsoft’s hyped expectations. The Android marketplace is overflowing with apps — more than 1.5 million in the Google Play Store — and most are free. Sure, a large number of free apps incorporate forced ads into the software, but higher-quality apps do so in a minimally inconvenient way. That being said, Android users who have needed document creation and editing capability for Microsoft Office files have always been able to find easy alternatives. Power users requiring more advanced features can easily upgrade for a one-time payment, as opposed to MSFT’s ongoing subscription plan. Further, since more than 50% of Android users are employed in a computer/tech-related position, it’s probably safe to assume most are savvy enough to navigate the ins and outs of their devices to minimize annoying ads and complete necessary tasks. How many of those people would suddenly choose to start paying a recurring fee to do something they already figured out how to do for free? The historical success of Microsoft Office is undeniable, but management’s attempt at using that popularity to shoehorn MSFT into the mobile space has been abysmal. The plan was to push Microsoft Office users toward Windows Phones, essentially strong-arming users by refusing to develop Android and iOS ports. Unfortunately for MSFT, forcing the hands of mobile device buyers didn’t work, as an unwavering loyalty to Microsoft Office didn’t actually exist. Windows 8 was supposed to be a launchpad, with the newest iteration intentionally resembling Microsoft’s mobile OS. Not only did MSFT fail to boost its stagnant mobile division, Windows 8 actually caused the worst quarterly decline in the PC market — ever. MSFT mobile devices didn’t fly off the shelves, either, which brought Mr. Softee full circle, back to looking at Office as a shoehorn. Despite the fact that Microsoft Office remains the preferred enterprise desktop document suite, the same can’t be said for mobile. Partnering with OEM’s to preinstall Microsoft Office for Android is eerily reminiscent of MSFT’s earlier ploy to boost its app store numbers and generate buzz by paying developers to port successful Android and iOS apps to Windows Phone, with some reports claiming figures as high as $600,000. However, when the surge of new Windows Phone apps failed to boost sales, there wasn’t enough advertising to fill the spots MSFT had promised to developers. So, the program was unceremoniously terminated. Since MSFT has seemingly enticed OEMs to preinstall Microsoft Office for Android with promises of revenue sharing, what expectations have been set? What guarantees have been made? On the surface (no pun intended), preinstalling Microsoft Office on new Android tablets will be an effective way to get MSFT’s iconic software suite into the hands of an ever-increasing number of mobile users. And, there will undoubtedly be an impressive bump in Office 365 activity, at least for as long as the initial free trial lasts. 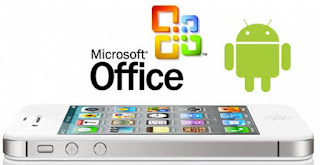 Once users are expected to shell out real money to keep using advanced features of Office for Android, the vast majority will simply go back to using the free Google apps, or whichever of the dozens of Microsoft Office alternatives they’d been using beforehand anyway. The percentage of users who agree to a paid subscription will be minuscule at best.